We all love butternut squash, but peeling it is such a chore. Well, I'll spare you. No peeling required here. For this scrumptcious soup, the squash is simply cut in half and slow roasted to unleash it's sweet goodness. Caramelized onions are added to the mix, then the food processor does all the work. It's finished off with a splash of sherry vinegar, herbs, and a dollop of creme fraiche. A perfect first course at Thanksgiving, or anytime at all. Recently I came upon an unusual recipe for watercress and arugula soup with spaetzles from one of my favorite chefs, Yotam Ottolenghi. It got me thinking about a different way to use up the Italian parsley in my garden that had grown to epic proportions. I decided to adapt his recipe by eliminating the arugula altogether, using only parsley with a small amount of watercress. What resulted came as a surprise - this was one fantastic soup! It's earned a permanent spot in my recipe file. As is often the case, I'll be hosting Passover dinner on Monday night. We will begin our meal with matzo ball soup, the ultimate comfort food. I'm often asked for my recipe so I'll share it with you. 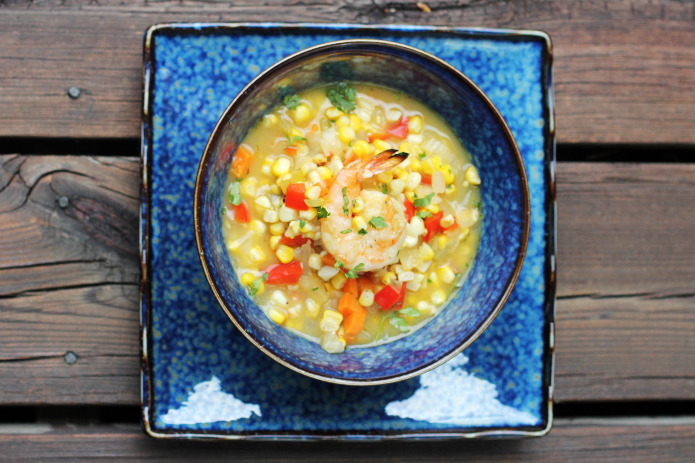 Make this chowder when fresh corn is sweet and in season. Chock full of vegetables and grilled shrimp, it's hearty enough for a light dinner. I prefer serving it lukewarm rather than piping hot, making it a nice choice for summer dining. 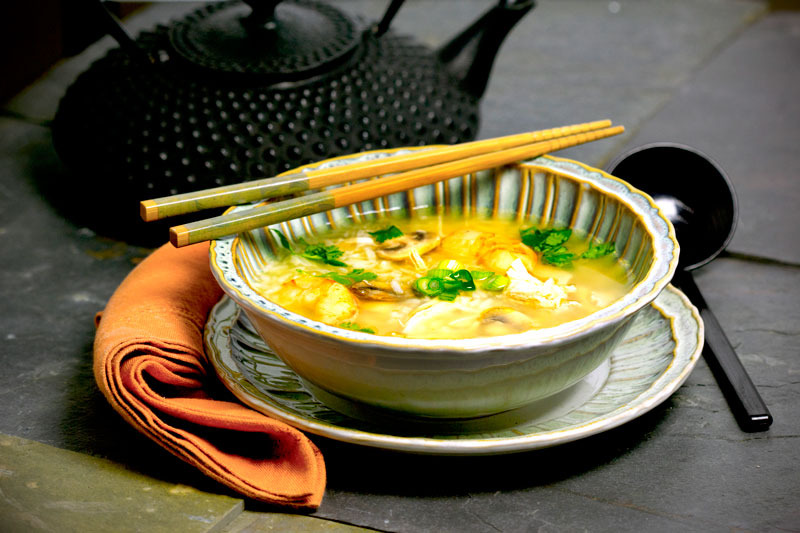 This soup is an adaptation of Chao Boi, a dish of northern Vietnam. I omitted the crabmeat and replaced dried mushrooms for fresh, but the essence of the soup remains the same.